EpoxAcoat® RED and EpoxAcoat® GREY are thixotropic epoxy gel coats which are widely used for hand laminating/tooling applications. They are tough and strong surface coat resins which cure at room temperature and offer exceptional abrasion resistance. Tarbender® Trial Unit Tarbender® is a UV resistant clear liquid epoxy that can be poured over a variety of surfaces to provide a strong, high gloss coating. Mix ratio is 2A to 1B by volume or 100A:41B by weight. Pot life is 60 minutes, overnight cure, hardness 75D. Color: Clear Net Weight : 2.83 Lbs. Tarbender® Gallon Unit Tarbender® is a UV resistant clear liquid epoxy that can be poured over a variety of surfaces to provide a strong, high gloss coating. Mix ratio is 2A to 1B by volume or 100A:41B by weight. Pot life is 60 minutes, overnight cure, hardness 75D. Color: Clear Net Weight : 11.3 Lbs. Tarbender® is a UV resistant clear liquid epoxy that can be poured over a variety of surfaces to provide a strong, high gloss coating. Parts A and B mix together and flow easily. Tarbender® epoxy cures at room temperature and offers high impact resistance. 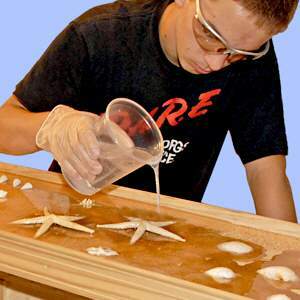 Tarbender® is an excellent wood bar top coating and can also be poured over plaster, concrete, foam, fabrics, etc. You can use Tarbender® to encapsulate 3-D objects or coat flat objects, paper and more. 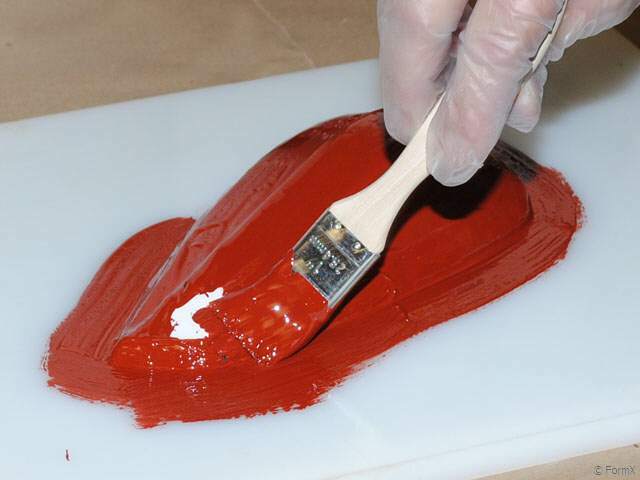 EpoxAcoat® RED is a thixotropic epoxy gel coat that is widely used for hand laminating/tooling applications. It is a tough and strong surface coat resin that cures at room temperature and offers exceptional abrasion resistance. Net Weight : 2.31 Lbs. EpoxAcoat® GREY is a thixotropic epoxy gel coat that is widely used for hand laminating/tooling applications. It is a tough and strong surface coat resin that cures at room temperature and offers exceptional abrasion resistance. Net Weight : 2.31 Lbs. EpoxAcoat® RED and EpoxAcoat® GREY are easy to use, wet out well over a variety of surfaces and will coat vertical surfaces without sagging. After the epoxy becomes “tacky-hard” at room temperature, fiberglass cloth is laminated behind the surface coat using EpoxAmite® Laminating Epoxy to produce strong, lightweight tools that have excellent dimensional stability and surface finish. 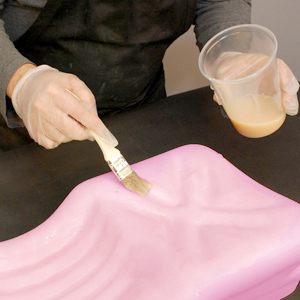 Free Form AIR® Epoxy Putty can also be used in conjuntion with EpoxAcoat ® and EpoxAmite®. Cured surface machines precisely without chipping. Applications include precision tooling, master and pattern making, core boxes and fixtures. EPSILON is color neutral, and cured material is easily sanded, primed and painted. EPSILON is excellent for use as a protective, impact resistant coating for EPS or polyurethane foam. It can also be applied to plaster, concrete, wood and fabrics. Net Weight : 2.8 Lbs. EPSILON is color neutral, and cured material is easily sanded, primed and painted. EPSILON is excellent for use as a protective, impact resistant coating for EPS or polyurethane foam. It can also be applied to plaster, concrete, wood and fabrics. Net Weight : 11 Lbs. EPSILON® is a thixotropic epoxy coating that self thickens for brushing onto a variety of surfaces without sagging. Parts A and B mix together easily, and the mixture wets out uniformly. This product is not sensitive to moisture or humidity. EPSILON® cures at room temperature to an impact resistant plastic which exhibits good compressive and flexural strength. EPSILON® is color neutral, and cured material can be easily sanded, primed and painted. EPSILON® is suitable for use as a protective, impact resistant coating for EPS or polyurethane foam. It can also be applied to plaster, concrete, wood and fabrics. This product is not sensitive to moisture or humidity and contains no VOC’s.